A Dozen Reasons to LOVE Eggs! When it comes to convenient, affordable and nutritious foods, eggs deliver the perfect package. Eggs play a significant role in mind and body energy, weight management, muscle strength, brain function, eye health and more! Whip up an individual microwave scramble in no time, or prepare the perfect hard-boiled eggs - either way you can't go wrong. Powerful Package. Eggs are a nutritional powerhouse, with one egg containing 6 grams of high-quality protein and all 9 essential amino acids, all for 70 calories. Eggs are also one of the few foods that are a naturally good source of Vitamin D, nothing artificial. Essential Nutrient. One egg contains about 125 milligrams of choline, making it an excellent source of this essential nutrient required for life's most basic functions, such as normal cell activity, liver function and transporting nutrients throughout the body. No Added Sugar. Eggs contain no sugar or carbohydrates, unlike most cereals and yogurt. Protein Power. Eggs are all natural and one of the highest quality proteins available. The high-quality protein in eggs provides the "building blocks" your body needs to grow and perform properly. The amount and quality of protein you eat directly affects muscle mass, strength and function; when eaten after exercise, protein encourages muscle tissue repair and growth. Breakfast Boost. Research shows eating high-quality protein foods for breakfast, like eggs, can help you and your family feel more energized and satisfied throughout the day as compared to eating more protein at lunch or dinner. Multiple scientific studies demonstrate the cognitive benefits of eating breakfast, such as improved memory recall time, improved grades and higher test scores. Eggs Make Cents. Eggs are very affordable compared to other high-quality protein foods. At just $0.15 each, eggs are the least expensive source of high-quality protein per serving. Long Lasting Energy. Starting the day with a high-quality protein breakfast like eggs helps provide sustained mental and physical energy throughout the day. Lower in Cholesterol. According to nutrition data from the United States Department of Agriculture's Agricultural Research Service, eggs have 14 percent less cholesterol (down from 215 mg to 185 mg) and 64 percent more vitamin D. In addition, more than 30 years of research have concluded that healthy adults can enjoy eggs without significantly impacting their risk of heart disease. Incredible Weight Loss Results. High-quality protein, like the protein in eggs, can help overweight dieters lose weight. Research shows that eating eggs for breakfast can help overweight dieters lose more weight, lower their body mass index and shrink their waist more than eating a bagel breakfast of equal calories. Fast & Easy. An egg breakfast is quick and easy. Simply beat an egg in a small bowl or coffee mug, place on high heat in the microwave for 60 seconds and add it to a toasted whole-grain English muffin. Top with low-fat cheese and a slice of tomato for a balanced meal. It's a speedy and satisfying start to the day that takes less than two minutes to prepare. Eggs Give Back. America's egg farmers not only provide quality eggs, but they give back to their communities as part of the Good Egg Project. Visit incredibleegg.org/good-egg-project to learn more. 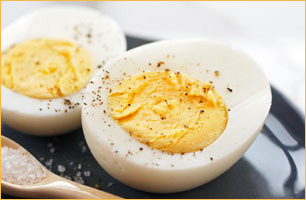 Visit IncredibleEgg.org for more hard-cooked egg recipes, tips, egg nutrition information and more. Layman DK, Rodriguez, NR. Egg protein as a source of power, strength and energy. Nutr Today. 44(1):43-48. Leidy HJ, et al. High-protein meals may benefit fat oxidation and energy expenditure in individuals with higher body fat. Nutrition & Dietetics 2008;65:246-252. Rampersaud G, et al. Breakfast habits, nutritional status, body weight, and academic performance in children and adolescents. JADA 2005;105:743-760. Pollitt E, et al. Fasting and cognition in well-and undernourished school children: a review of three experimental studies. AJCN 1998;67:779S-784S. Vander Wal JS, et al. Egg breakfast enhances weight loss. Int'l J Obesity 2008: 32(10):1545-1551. US Department of Agriculture, Agricultural Research Service, 2011. USDA National Nutrient Database for Standard Reference, Release 23. Online. Available at: Nutrient Data Laboratory Home Page, http://www.ars.usda.gov/main/site_main.htm?modecode=12-35-45-00 . Accessed March 14, 2011. Goodrow EF, et al. Consumption of one egg per day increases serum lutein and zeaxanthin concentrations in older adults without altering serum lipid and lipoprotein cholesterol concentrations. JN 2006;136(25):19-24. Chung HY, et al. Lutein bioavailabilty is higher from lutein-enriched eggs than from supplements and spinach in men. JN 2004;134:1887-1893. Here are a dozen reasons why eggs should be a part of your daily breakfast routine.